As with most things that matter I’ve always taken the view that if you form things via strong personal relationships you move forward, you’re stronger. I’m heartened by the progress we have made in the past two years from our early structure when I worked in The British Museum (we’d already been going for 15 years, we met and talked and aspired to more) it was a good foundation. That’s what I have found in the continuing journey in the building of AVCF. In October I made a small presentation at RIBA entitled ‘AVCF Year 3’ because it is indeed that anniversary. Our third year. And, we’re told, time doesn’t fly! So, what is planned Chris I hear you cry (the voices, when will they stop…). Well, IAV18 was our first attempt to raise sponsorship with the intent of putting the Forum on a robust footing as a company, (non-profit) and begin to build its resource to think bigger. That small fledgling step has proved successful. I’d like to thank White Light for sponsoring us beyond the event itself for a whole year, and also our long time original supporter and sponsor Jacobs Massey. Both at our Platinum level. 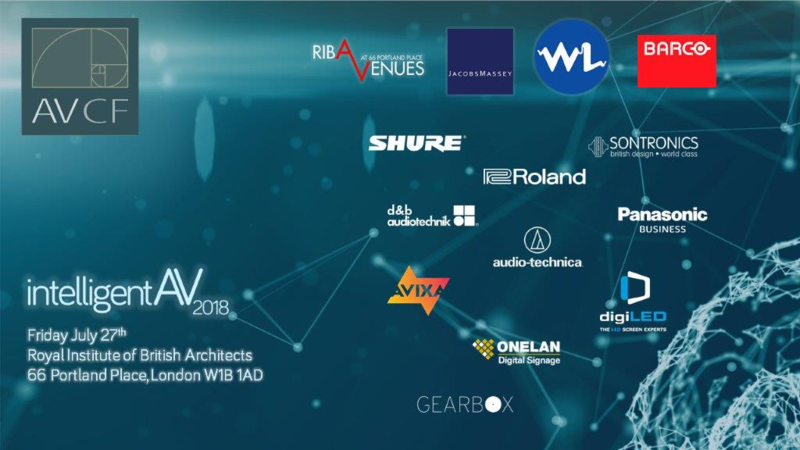 And also, special mention to Shure UK for being gold level sponsors for iAV18. 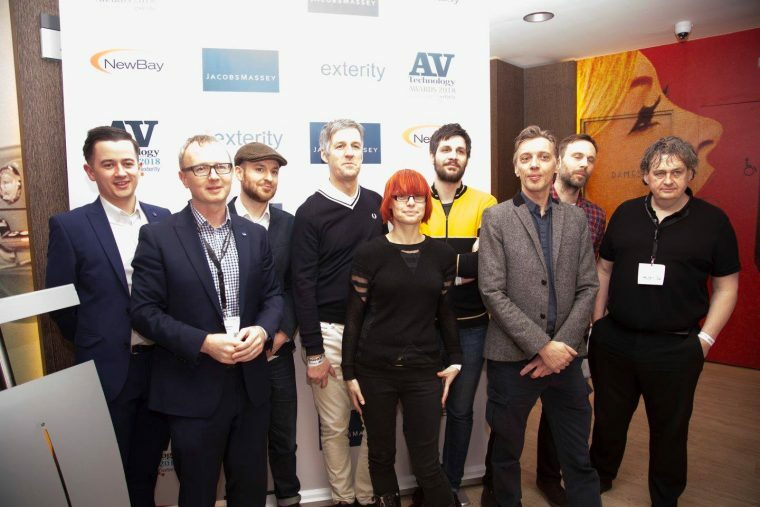 Plus everyone who threw into the day itself; Audio Technica, One Lan, Canon, Sennheiser, DigiLed, Canon, Gearbox Records and of course our great supporter AVIXA. A minimum of 4 key events announced in advance for 2019. Something you can get in your diaries. Plus: Our very own slant on the Podcast. Plus: Bespoke events for key sponsors around AVCF activities and events. Plus: For members we’re even looking at the crazy world of App development (we can dream). Well, things to do, places to be. Here’s to the future and our third year. PS Don’t forget Our Birmingham visit on Nov 6th, this for anyone who is now free. This time next week I hope I will be seeing a lot of you at RIBA (Royal Institute of British Architects) for iAV18. Go on you know you want to. If you haven’t registered via our Eventbrite site yet, I would advise you to do so now (link below). We have a great day planned. So, exclusively, here and now and just for you first, we can announce the following from our programme for the day. Our headline sponsor this year, White Light, will be presenting the following from 10.15, what I lovingly refer to as a WL Quartet. Jason Larcombe (Senior Project Manager/Lighting Designer) – Investing in spaces to unlock potential. 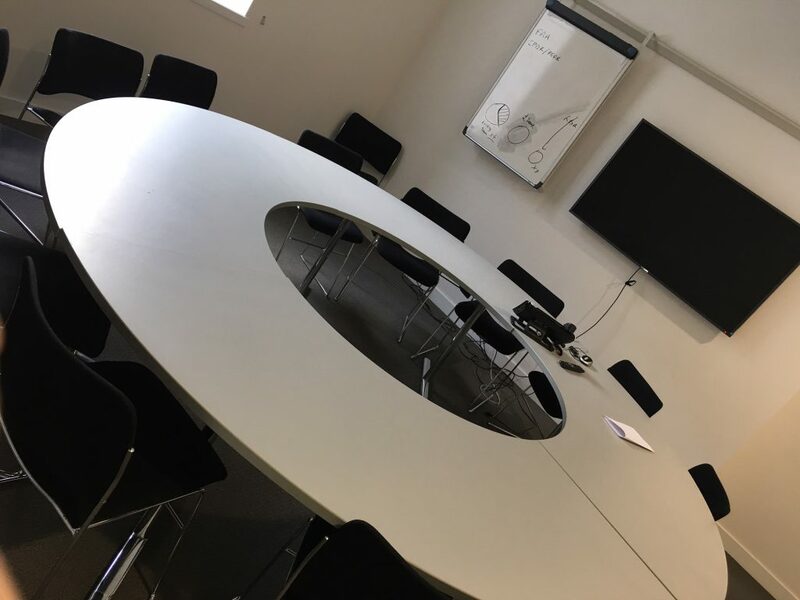 Jason has been working on a number of recent projects with organisations, unlocking potential and creating new commercial opportunities within existing spaces and venues. WL works closely with Ryan, who’s company scans and creates VR assets for theatre, in order to allow shows to be conceived and developed virtually before getting into the physical theatre. A review of some of the latest technology driving venues forward. Rebecca’s career started in English Heritage before joining the AEG at the O2 as General Manager and VP where she was responsible for introducing commercial initiatives into the organisation. Rebecca has recently taken a new post as Managing Director of Really Useful Theatres Group as the embark on regeneration projects within their theatres. This session will be scheduled as 4 x 15min presentations followed by a 15min Q&A. We have a very special keynote presented by one of the world’s top stage and screen consultants for practical illusion effects, Paul Kiev. Paul’s subject is the birth of the stage effect known as ‘Peppers Ghost’ and its use today by West End and Broadway productions. 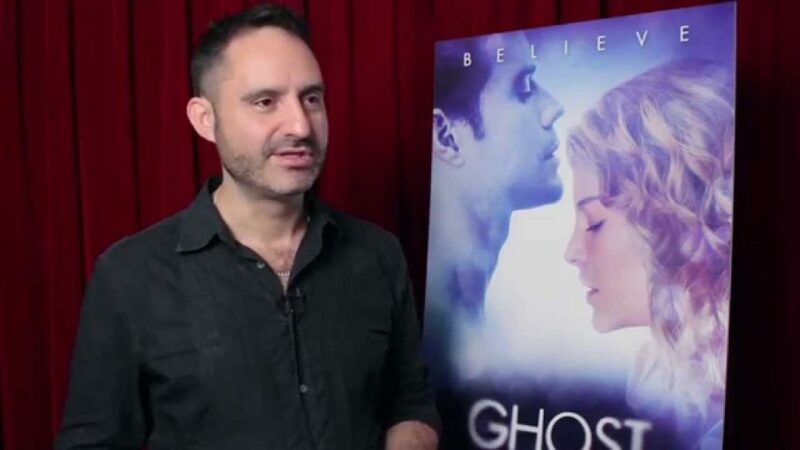 Paul has worked on stage and screen including ‘Matilda’ ‘Ghost’ and films such as ‘Harry Potter and the Prisoner of Azkhaban’, with Martin Scorsese on ‘Hugo’ and various Disney live productions. That only scratches the surface, believe me! In the afternoon, Shure, who are great supporters of AVCF, will explain some of the nuts and bolts around spectrum and frequency allocation. A topic that really affects all of us and sometimes gets overlooked. We’ll wrap up with a big Q&A around 4pm drawing together themes that have arisen through the day. I should point out that throughout the day there is plenty of time to wander and network with a myriad of experts in many fields and look at displays and products in the magnificent Florence Hall. All this in the unique laid back style that AV Cultural Forum fosters. Oh, did I mention the drinks reception? Well, from 6 till 8, courtesy of Jacobs Massey and Avixa, we’ll continue the fun and networking. Hey, what’s not to like. There’s more from me to come through next week leading to the day itself. And, here’s that link again so you don’t even have to scroll back to the top. Well, a lot of our time is now focused on the run up to this year’s iAV18 at RIBA. Of course we have other things bubbling along (see below) but first, it’s great news that both Shure and d&b audiotechnik, will now join platinum sponsors White Light and JacobsMassey, They will join us, support our day and interact in a unique gathering. 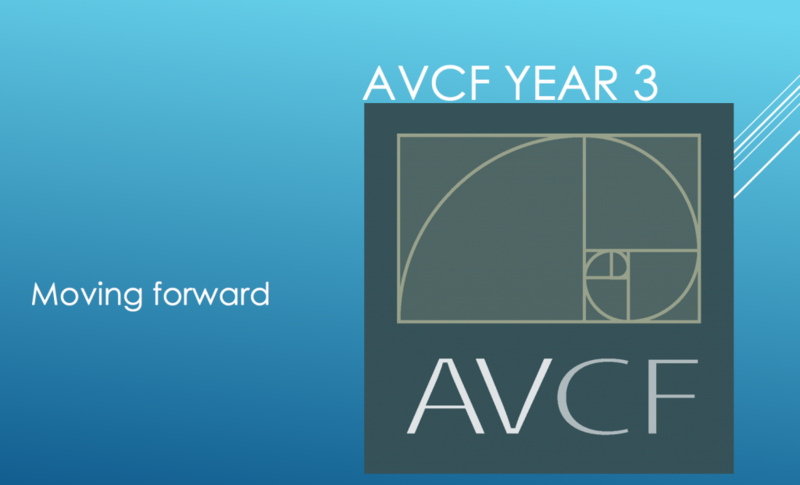 A gathering that only the AVCF community can deliver. London N1 9AG. An ideal chance to visit, learn some interesting things (a concert hall made out of one huge tree) and as usual exchange ideas. Thanks to Krisztian for providing AVCF with this great opportunity. Let me know via email if you plan to come along so I can collate numbers. Or, I thought so, until we looked into this GDPR stuff! A simple message will come to you soon asking if you agree to receive our posts. I’d be grateful if you’d tick the box/press the button, to opt in. We want you in the Forum community. Exciting news for us at AVCF as we prepare for iAV18 on July 27th. So here’s the latest. A new sponsor joins our adventure… you saw it here first! We are delighted to announce that White Light has joined us at AV Cultural Forum as a platinum level sponsor. This will include supporting us for our flagship event iAV18. 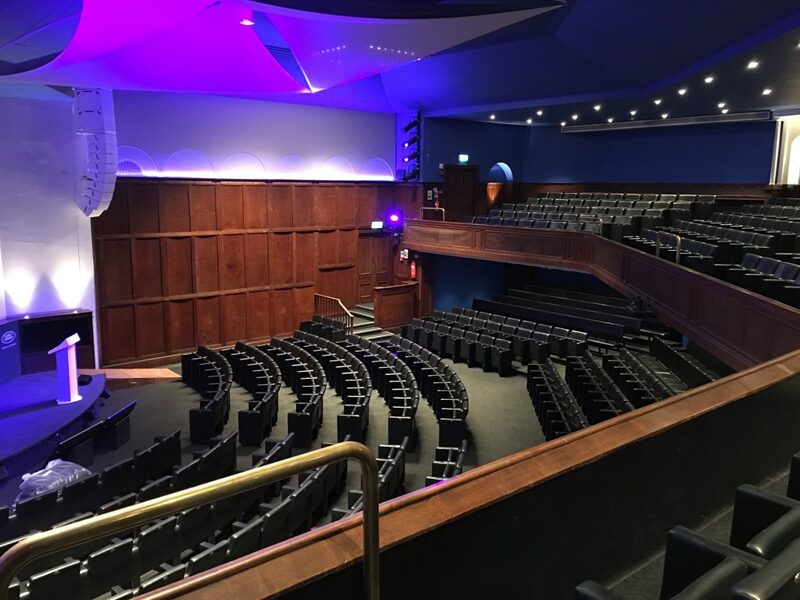 The event will be held, in this our second year, at the magnificent RIBA venue (Royal Institute of British Architects) on Friday July 27th 2018. They will also be helping us as we move forward on our adventures. White Light is the complete technical solution specialist operating in a range of markets such as theatre, corporate events, broadcast, themed attractions, education, retail and leisure. 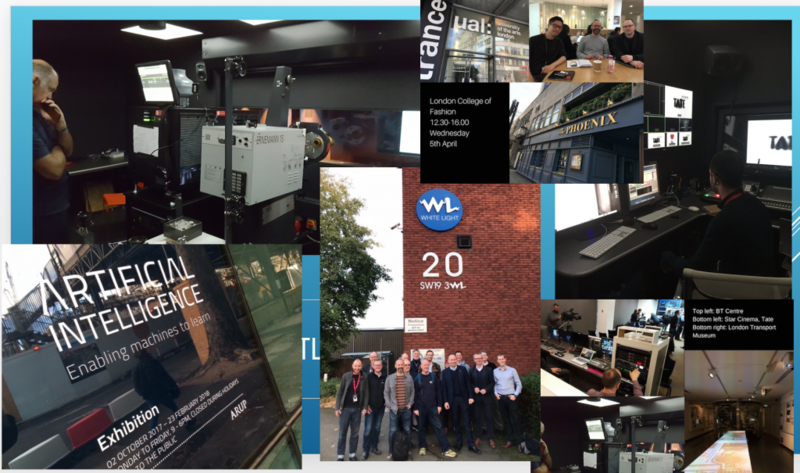 Offering a wide range of installation and consultancy services, WL is your partner for all your lighting, audio, video and rigging needs. Over the years, we have completed projects of all sizes across the UK, Europe and worldwide. Alongside being an approved supplier to Historic Royal Palaces and Unique Venues of London, we regularly work with The Natural History Museum, The V&A, Banqueting House to name but a few. We have also just been announced as the Production Partner for Illuminate – the Science Museum’s new event space opening early 2019, where we will design, integrate and operate a world-class technical installation. Based in London, we pride ourselves on our industry knowledge, personal service and high technical standards. With every client, we have maintained the same customer focus and commitment to quality that led to our previous success. The AV Cultural Forum is a community for AV Managers, Senior Technicians and Technicians seeking to discuss their experiences and to exchange ideas, information and knowledge with peers and contemporaries. Thus, helping them deliver improved AV in their organisations. We arrange bespoke events which act as a platform for our members to see emerging trends and get together socially. 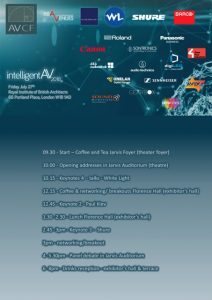 The highlight of our year is the iAV (Intelligent Audio Visual) event for which we assemble handpicked manufacturers and organisations to display and talk to our membership, engage in our panels and create a more relaxed environment for our community, not afforded at big ‘sales expos’ in the industry. Ben Bernard from AVIXA will be coming along to give us a rundown of things as they stand and their plans for the future. This is a theme that will run forward and foreshadow IAV 20I8. The timings are 6-8pm, with some coffee and snacks supplied. And, of course, there is a very nice pub around the corner. Monday was a great example of why being a part of the AVCF family pays dividends. So, Monday morning rolls in, and the ‘weekly call’ with it. Allow me to explain. Like all Monday mornings, this conference call involves: Event managers; Logistics team; Catering; Venue managers; Video production team; and AV. On today’s call there was an event manager who had been to an away day and witnessed first-hand lots of interesting new ways to make events more ‘interactive’. This evidenced by use of a hologram projection at the venue, this in Berlin, so that a keynote speaker was not only locally present, but could also ‘appear’ in Belfast. Miracle! Also, with ‘some kind of headphone system’ allowing several break-out group presentations to take place in the same exhibition hall. Each group only listening to their particular presenter’…(not my words, this is the event organiser). Everyone on the call thought it all sounded great! Happy shiny people all round. Now, cue forward to the point at the end of the call where I am asked to provide information on these ‘miracles’ by the end of the day! A call to the ever-knowledgeable member, Liam Helm of The Royal Society, (guru) reminds me of the name of the Sennheiser kit we had seen in action during an AVCF day-trip to Sennheiser HQ at Marlow. A further chat focuses on who has this kit and in which venue, and how well it works. Even with all the will in the world a look at some kit on a website is great but is not a substitute for talking through with someone who has used and tested the kit in earnest. I send the link to the website as part of my report, happy in the knowledge that I can phone said member of AVCF and ask for their views if i need more informataion. Liam and I then chatted for a few more minutes about another issue I had been facing of wireless connectivity for laptops that have USB slots disabled… Again, another product is discussed and another AVCF member has something I could ask about. It is, as you said Chris, ‘people not boxes’. PS: Musion3D are the hologram team who can bring external presenters to life (and also made Biggie and 2Pac come back from the dead at Coachella a few years ago). And, MobileConnect is from Sennheiser. There seems to be a bit of momentum going as we slowly expand, so I’d like to welcome onboard two new members: Alfredo Radetich of The Royal Geographical Society in South Kensington and Krisztian Vass of Kings Place in St Pancras, both in line for up and coming visits by AVCF. Welcome chaps. 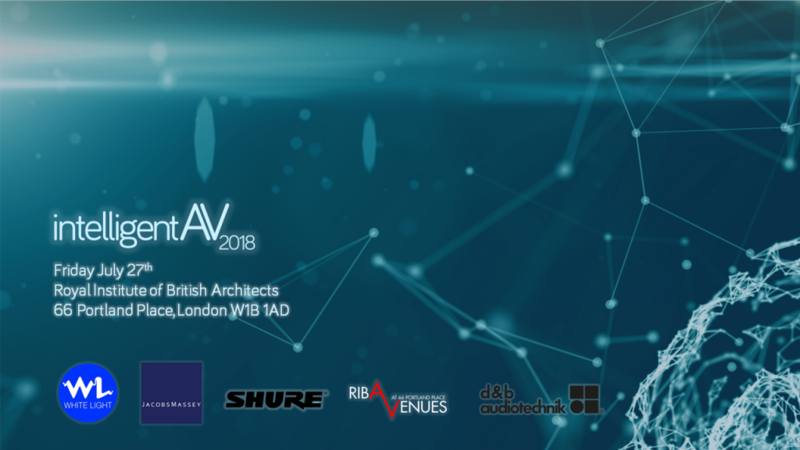 You may well notice, but I’m telling ya anyway, that Gabriel Thorp of RIBA has been constructing a new tab on the site entitled; IAV 2018 to be updated when new info comes in, but consider it the first marker about our big day on July 27th this year. More info soon there and further news from me on the blog. Did I tell you the some Forum members went to visit? Probably, (we’ll have another date available soon). Keep the emails flowing and spread the word. The title of this blog post derives from a quote over the tomb of Sir Christopher Wren in St Paul’s Cathedral. 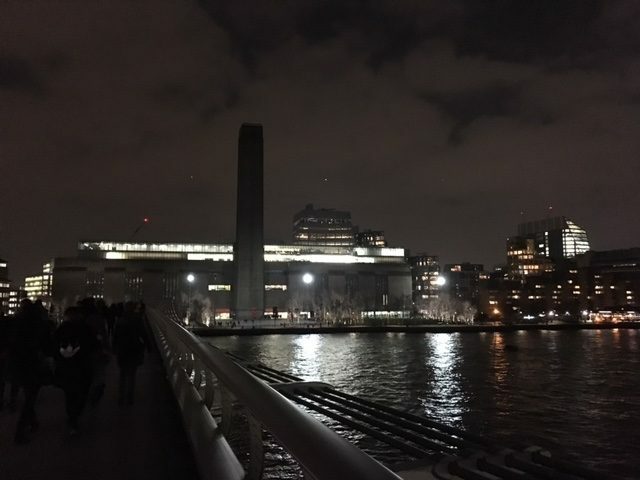 Hence my picture, this was taken on leaving Tate Modern after attending their February Uniqlo Late. 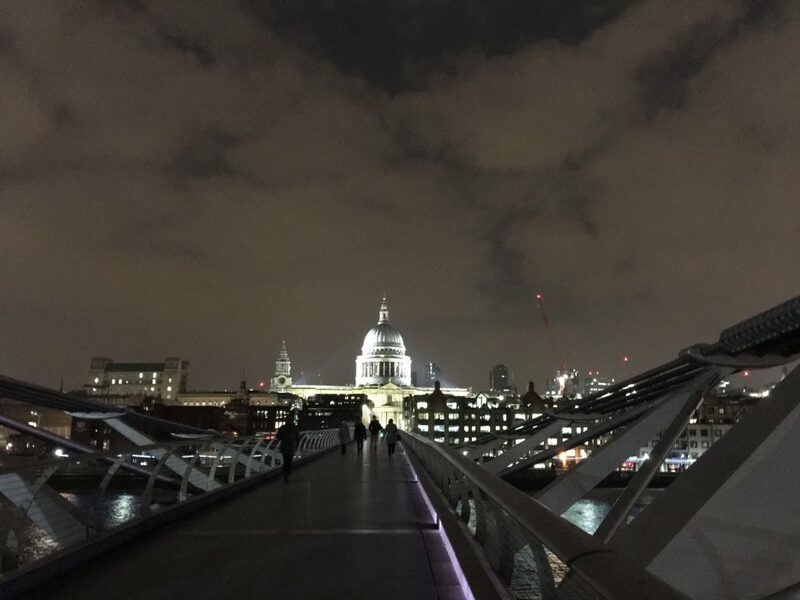 As I crossed the so called ‘wobbly bridge’ at 11pm this view seemed to put Tate, London and all of it’s cultural context on view as the Thames passed below. I have to say, It was a fantastic night and a great example how the AV discipline plays a big part in delivering an atmospheric events. The report below is written by our member Josa Taylor and is the first, of what I hope, will be exclusive content from Tate AV. Thank you Josa for writing this and taking the great pictures, and also, a big thanks to Dan Crompton, the Tate’s AV Manager for enabling this initiative. 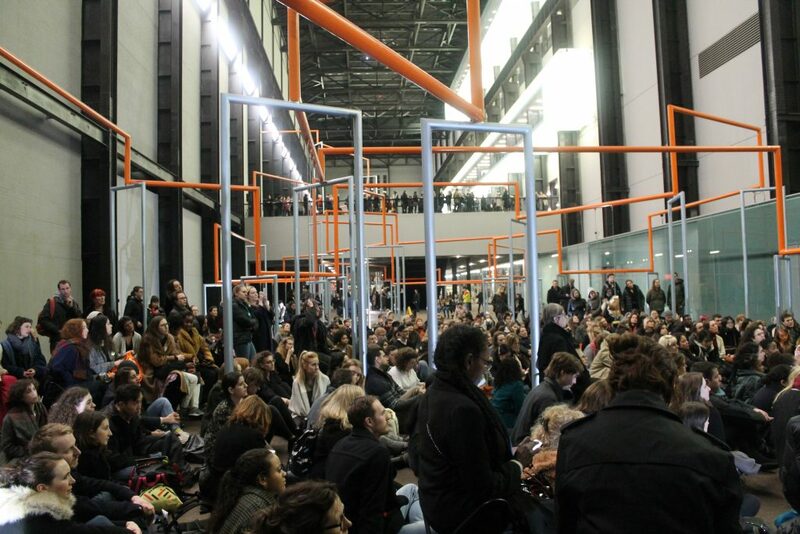 Hosting thousands of visitors monthly, Uniqlo Late at Tate Modern has been a great success. We have people of all ages attending to enjoy the music, performances and discussions here at Tate Modern. The theme of this particular late was women in the arts, so the place was thriving with talks and we were surrounded by strong female characters. Some of the performances were programmed by gal-dem, the award-winning magazine written and produced by women and non-binary people of colour. It was an extremely popular event and we estimate 15-20 thousand visitors came throughout the evening. The TATE AV team worked throughout the day and night, all on facilitating some very interesting content. These events are a good example of the hardest and most challenging activities the AV team support, and is possibly the biggest team we build and amongst the largest scale events we run. On the night, for the Tanks, we had a fairly low key set up. Gal-dem programmed four DJs to perform throughout the evening. These guys smashed it. We had a Pioneer & Technics DJ rig, with Meyer PA, a mix of in house systems and equipment hired from one of our PA partners, RNSS, some really great kit! 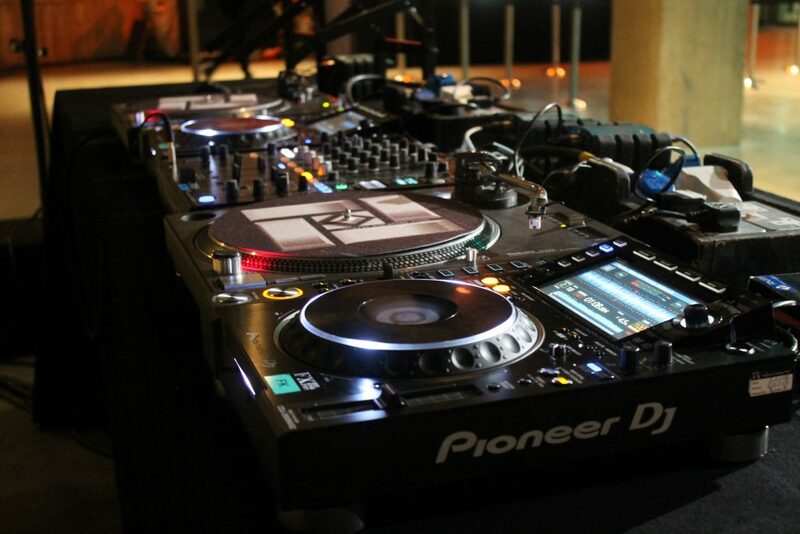 The DJs had the room busy and buzzy all evening, the atmosphere was happy and exuberant and the sound was excellent. Part of the key to working with these artists is spending the time preparing and negotiating with them to plan the set up. We have to cater to the specific needs of the artist and what they need to be prepared for them before they arrive. For this night we had one DJ who was using a Spotify playlist for her set. This could cause problems as there’s always a risk when relying on content from the internet. Never robust enough for live gigs in our view. So, we had a local USB drive backup with music available just in case, so that we wouldn’t be short of music. But we were not disappointed, as all the sets went to plan and the tanks were a dancing sea of happy music lovers. 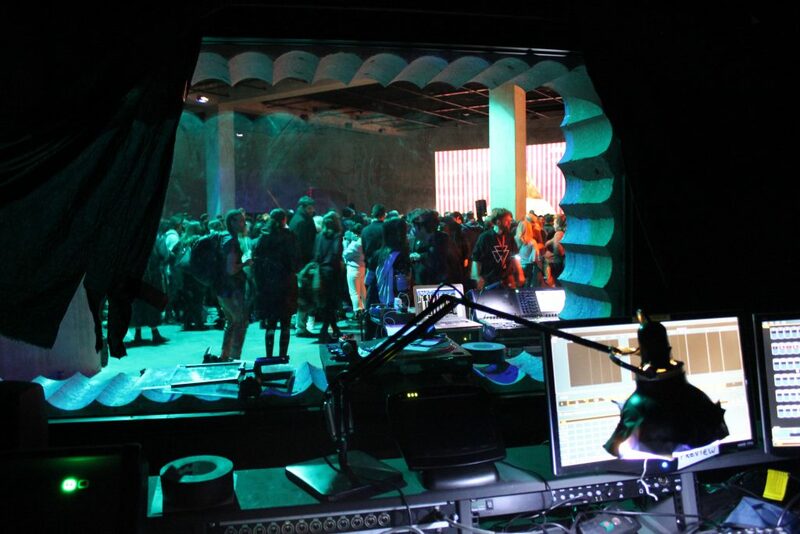 Something that we love about these Lates are the innovative activations in different spaces. It’s probably the most interesting AV we do and each space is so unique with different demands. An ‘activation’ is a Tate term for when we bring a gallery to life with some form of activity, beyond the static display normally found there. 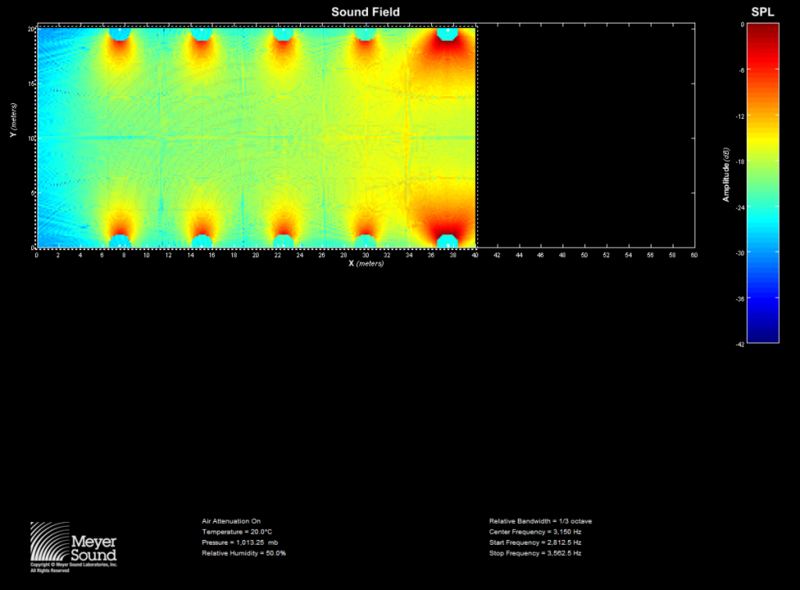 These activations usually incorporate some form of AV or other. The Turbine Hall was a great example of this. We went much further this time (team members were setting up all the previous night) rigging the loudspeakers and getting them in just the right configuration. This was very challenging because the hall is so big it needs to be loud, but also avoid excessive natural reverb. We accomplished this by using sixteen Meyer MM4 & two Meyer UPJ loudspeakers with Galileo processing and a Yamaha QL1 mixer. Spaced at equal distances apart throughout the hall to secure good coverage for the whole space. 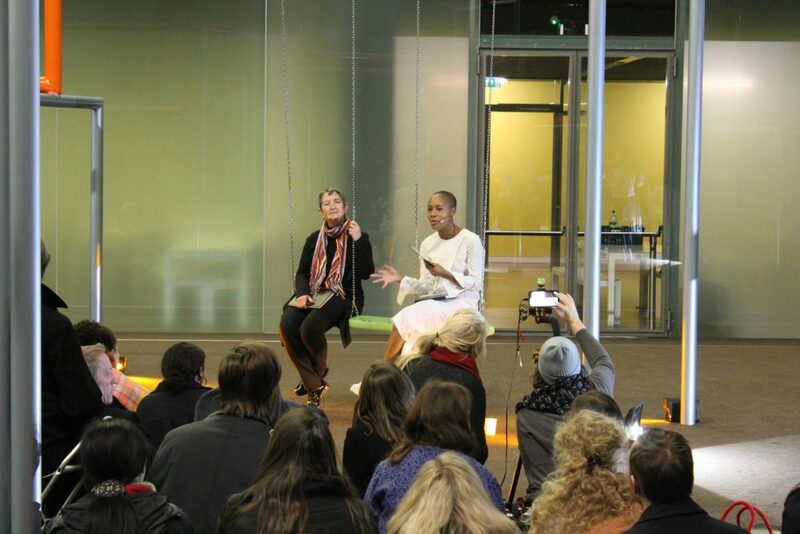 These we used specifically for the Q&A with Frances Morris, direcTate Modern’s Director and Liv Little, gal-dem’s founder. They sat on the swings (Tate’s current Turbine Hall Hyundai commission, One Two Three Swing! By Superflex) in the Turbine Hall whilst having a discussion and chatting about their roles. 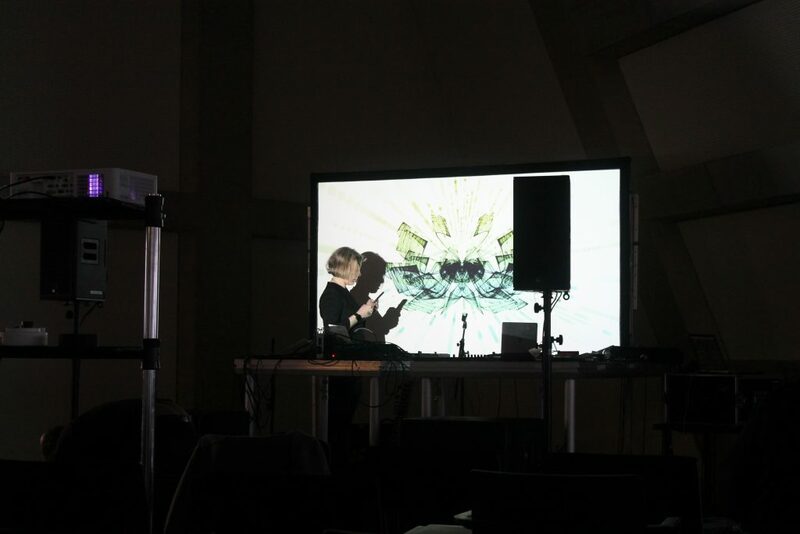 Tate’s digital team did a live stream of this via Facebook so anyone not here could view remotely. There were some issues with the connection of the interface to the PA system into the iPhone X used, as we had not been able to prepare the recording before the day, so RF hook up wasn’t easy. But there was only a short delay for the guests, a small price to pay for the effect gained. We used DPA d mics and Shure radio transmitters, sending the feeds over RF instead of cables in the more inaccessible places. This worked much better for such a large space, but there is always the risk of the RF picking up interference. There are also risks when using cables, as they can be damaged or unplugged, but luckily we didn’t come across any of these issues. Some of this equipment was set up the day before, but other elements were not, some last minute improvisation was needed. This is one of the things we relish at Tate AV, getting various systems in place quickly to keep the ball rolling. The Tate Exchange space is a vibrant hub of activity on the night. The room was filled with activations to get people involved and create their own art work, themed for the event. This is a great way to entice visitors, as they need to be drawn in, we aim to be inviting. We set up coloured lights along with screens showing the visuals to create an atmosphere and inspire people to look around the environment. 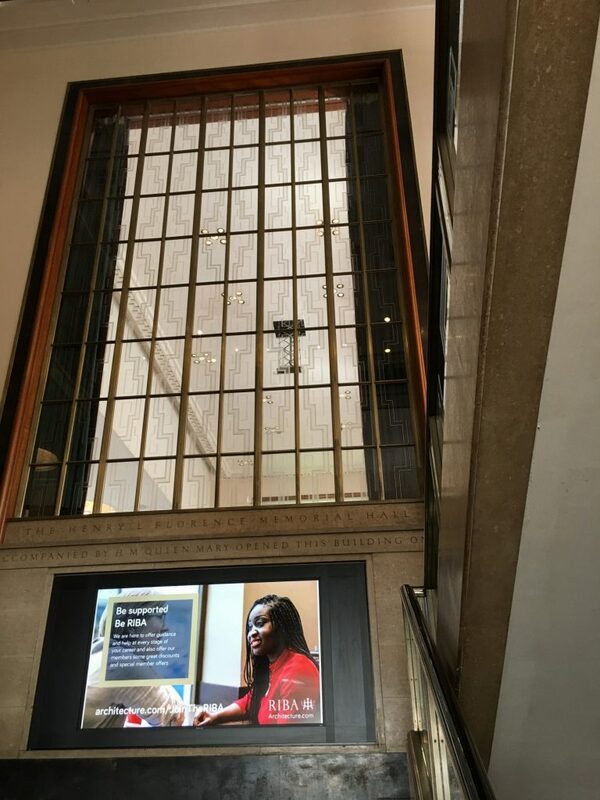 Tate Exchange, used in this way, encourages people to explore their artistic flair and we supply ways to more intimately communicate using sound and vision. For example, with headphones attached to a big screen, people can use without too much distraction from the surrounding audio content. It’s all about participation and engagement, especially at these big events. Throughout the week Tate Exchange is occupied, in this case by Represent! who were running the space. Equipment is used throughout the week but on Friday we ramped it up. 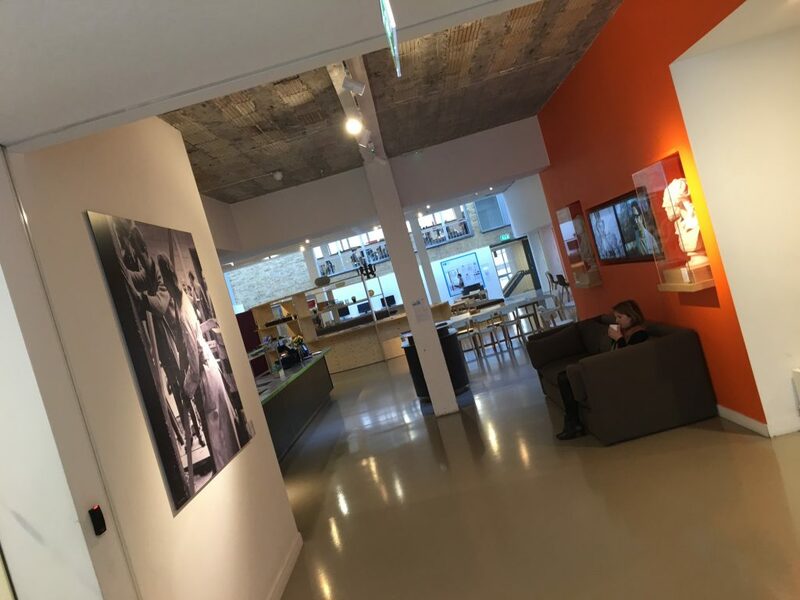 Described by Dan (Tate AV Service Manager) as ‘an eternal shuffle’ we alter the space and equipment to fit the frenetic activities throughout the weeks. Shifting elements to fit each event. Dan describes our equipment at Tate like Lego. Taking the building blocks and rearranging them regularly, moving stuff around and setting it all up in different places for different uses. Like builders of sound and vision. On level 6 we had a traditional stage setup in terms of the use of space. The ‘WITCiH Salon’ is a platform hosted by musician, artist and co-founder Bishi. She was performing along with three other female talents. We had to meticulously plan this one in advance as these guys have special instruments and ideas about their sets. Bishi uses a sitar that we needed to D.I. 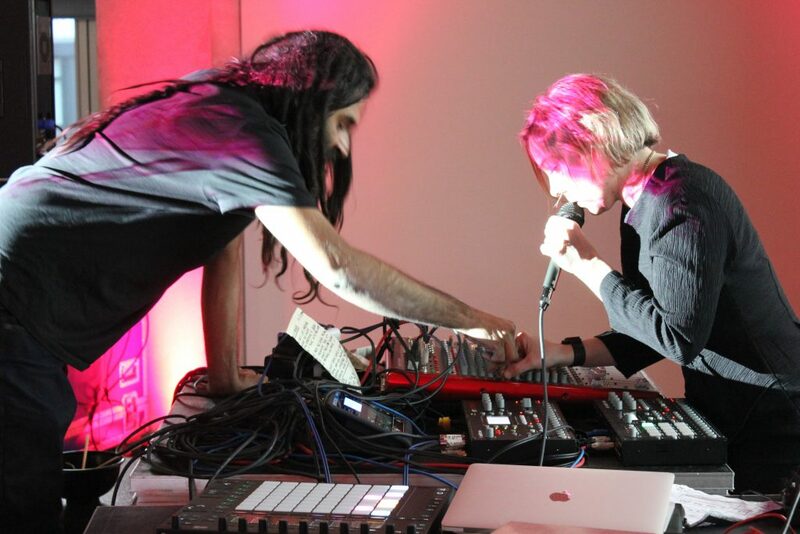 into the PA, along with her voice, RC505, Ableton Push and Scarlett 6i6 combining a highly traditional sound with cutting edge contemporary equipment is not easy of course. The key was to engage our friends and colleagues from Surplus Sound who have a special sensitivity and understanding of arts AV, to help run the show. WITCiH had planned projections for their backdrop which we needed to line up carefully in advance using our Christie projectors. This was a popular event, was packed out and the sound worked amazingly well for the audience, spreading evenly through the unusual space. Big sounds going on; 2 Meyer UPJ powered speakers with 6 of Surplus Sound’s HK Audio Premium PR-O 210 subs, so the music could travel well. The stage set up was altered slightly for each performer. During the sound check we worked out how to do each switch quickly and efficiently. This space on Level 6 is a good illustration of how the team have to mix and match hire equipment and artist’s equipment with our own. In all, an ideal example of cultural AV we feel. Why not come along and check out our next Uniqlo Late at Tate Modern? As your Chairman said when he came along ‘it’s really kicking here’. And so it was, Kicking! And finally, just to let everyone know, I’ve had 18 people telling me they’re interested in going to Bloomberg HQ for a visit. The spaces on the 28th of March are now full (8 per visit) but I am negotiating for extra dates so, let me know asap and soon as I get further dates, I’ll be in touch. Hopefully for April/May. A big thank you to our member Abdul Rafique at Bloomberg, for arranging this opportunity for AVCF. Well, the Oscars are about to happen (no predictions, as this blog post is in the pipe on Sunday evening) and as a bit of a film buff I’ll be following a strong year of contenders and it will also be interesting on political fronts. 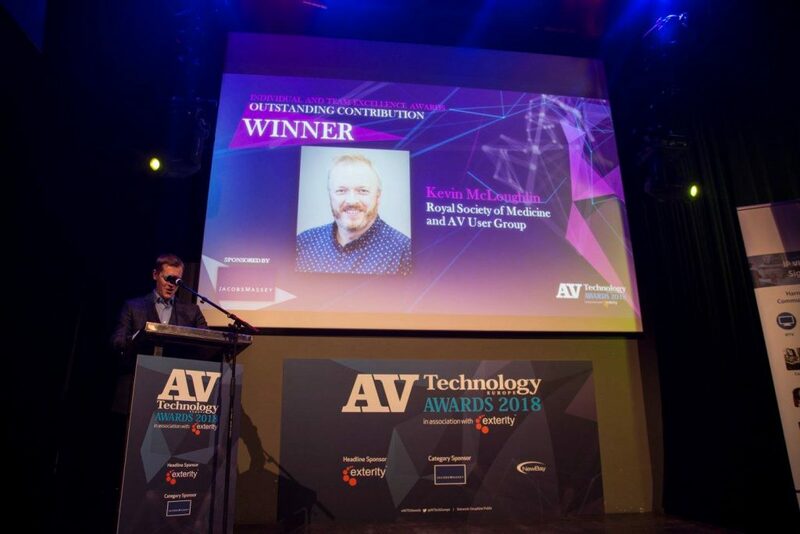 Speaking of award ceremonies and strong contenders I’m sure some of you will have attended either the InAVate or AVTech Europe versions of the above at ISE. Our members were well represented. Of course the big dog in the game, which celebrates it’s 20th anniversary by the way, is the AV Magazine Awards in September at the Grosvenor House. Good luck to all of you who are throwing their hats in the ring. Will hope to see some of you in September. My congratulations to the shortlisted entries and winners at the two ISE events. 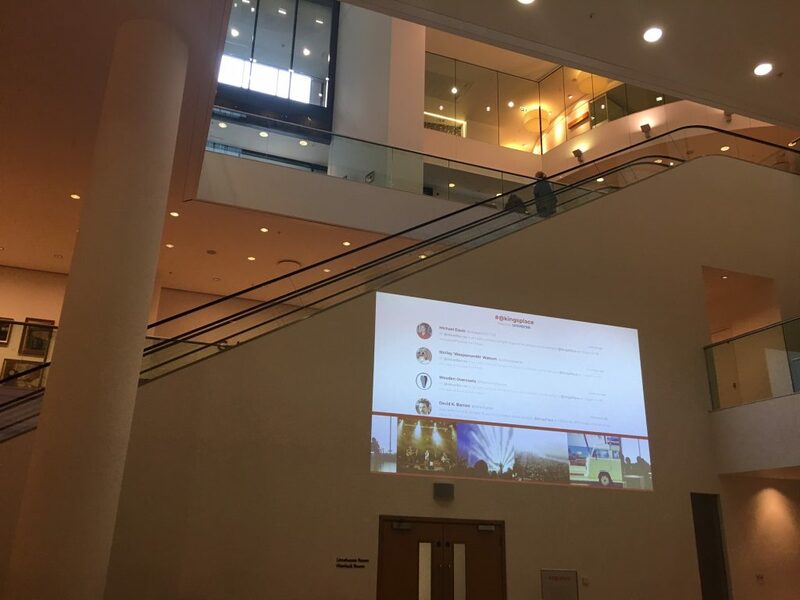 This year I went to the inaugural AVTechnology Europe event and was pleased to see our members giving a good account of themselves. It was a very strong list of entries and I have to say it was not an easy gig to be a judge on. Yes, I was one of those judges. Believe me, when organisers at these bashes say.. ‘it was not an easy task etc etc..’ That is so true. However, a big shout out for our members at Bloomberg HQ Darren Waszinski and team came away with a lion’s share, The University of Hertfordshire with Adam Harvey bringing in gold, and of course… ‘The Man on Fire’, Kevin Mcloughlin. Is there anything he and his team at Wimpole St haven’t won! Well done Kevin. And to our members who were shortlisted. Jon Sheldon and his team at The National Gallery and Jon Harris at Birmingham Museums Trust. (From L to R) Niall Cunningham and Graeme Massey (from JM), Ewan Crallan (British Telecom), Liam Helm (Royal Society), Karen Worden (RAF Museum) Alex Sorenti (National Gallery) Dan Crompton (Tate) Jon Sheldon (National Gallery) and some suspicious looking character at the end. I’m having an exploratory visit in March to Bloomberg’s HQ in the city, courtesy of member Abdul Rafique and team. This with a view to arranging some visits for Forum members in April/May. The visits have a limit on group numbers to view the AV AV in it’s best light. So, it would be great if you could email me with your interest so I can see demand on who’s interested. As we’re aiming for April/May drop me a line and watch this space. Coming hard on the heels of this post is something that touches on our plans to move forward as I outlined in my January 16th post. We’ll be looking at Tate’s Late Event with input from member’s Josa Taylor and Dan Crompton. Dan, as some of you know is heavily involved in co-ordinating AV at Tate and Josa is working with Dan and us in her capacity as a Graphic Communication specialist. Also helping me as we move forward to IAV day on July 27th (more on that soon), Gabriel Thorp from RIBA AV, will be helping me and the Forum to expand our world with this web presence. He’s a bit of a whiz on this side of things.